Making an appointment with a consultant? You can make the appointment by calling the consultant’s clinic nurse, or call our JMC General Line at 088- 366333, if you are not sure about the consultant’s extension number. Who are the consultants in JMC, and what are their specialties? JMC currently has 26 Resident Consultants, 5 Resident Medical Officers and 14 Visiting Consultants. You can refer to the list of JMC Consultants for further information. What should I bring when registering at JMC? Are there any deposits for admission? Yes. A deposit of RM3,000 is required for General Ward admission and RM8,000 is the required deposit for ICU Ward admission. What are the types of room available in JMC? JMC has 2 types of rooms: single-bed & double-bed. Further information can be found on our Room Types page. Are there any Maternity Packages? Yes, we have 2 types of packages which are: Normal Delivery Package and Caesarean Delivery. You can refer to these two packages on the JMC Packages section of our website. Are there any Medical Health Screening Packages? You can refer to these packages on the JMC Packages section of our website. Do you have 24-hours services? Yes. Our Emergency & Trauma Department and Ambulance Services are 24x7. The Emergency & Trauma Department contact number is 088-366399. What type of payment modes does JMC accept? Does JMC accept Guarantee Letter from a company and/or insurance agency? Yes. It depends whether JMC is registered with the panel of that particular company or insurance company. Pay & Claim will be practised if JMC is not registered with the Medical Panel. 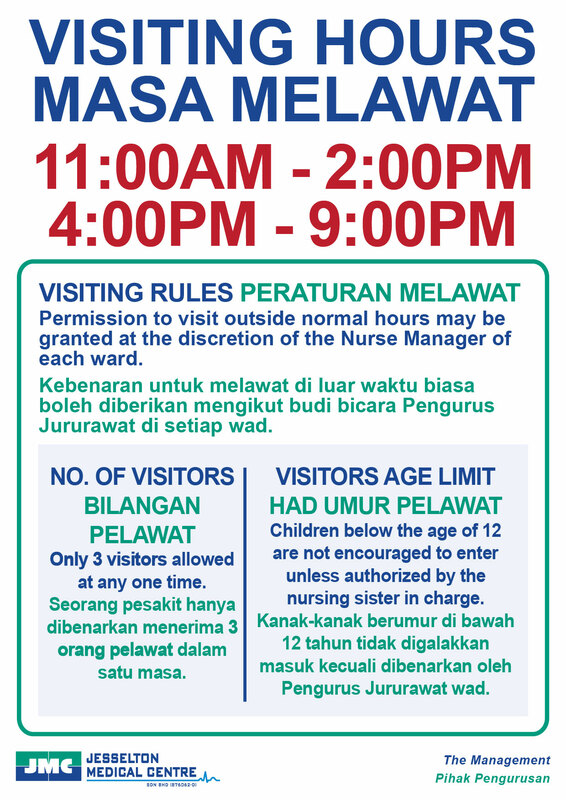 What are the visiting hours and associated rules in JMC?